In today’s dynamic and highly competitive marketplace, the biggest challenge for cryptocurrency business startups is to build the exchange website with high-level security and features. Building a customized bitcoin exchange platform from scratch to the cryptocurrency startup and entrepreneurs may lead business failure.While by choosing white label solution, you can attract your valuable customer instantly & achieve the business success within the minimum period of time. Having achieved rapid global success due to domain expertise, excellence in software development services in blockchain technology across all the industry, Oodles Technologies has launched a Re-Utile Ready Built Base Product, Oodles Scaffold to sparkle the cryptocurrency business success with Less Project Time & Cost. The product — Oodles Scaffold — would help business startups & entrepreneurs to speed up the development workflow and procedure with so that you don’t miss out your valuable traders or customers. There is no shortcut to cryptocurrency exchange business success but there is one magic formula that can build “multi-secure” cryptocurrency exchange platform with unique features. Oodles Technologies came up with this idea to revolutionize the trading platform development & increase the customer’s success. It was named “Scaffold” which mean “Minimum & Sufficient” & this base product fulfills the meaning of its name as provides required functionality with less time period & cost. 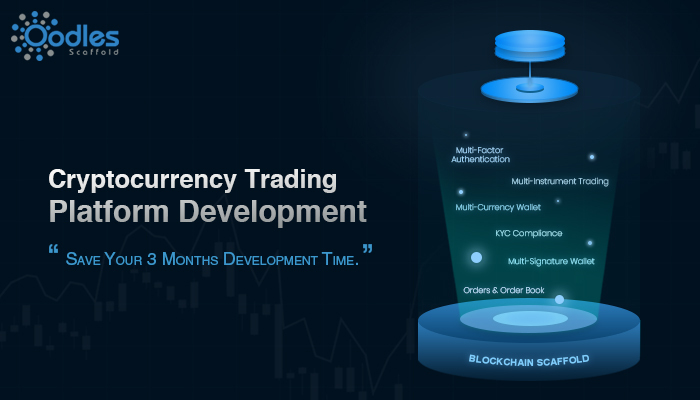 It is packed with innovative high-level features such as Multi-Level Authentication, Multi-Signature Wallet, KYC Compliance and much more to take the trading platform to the next level & maximizes performance and scalability. This product will also allow Easy Customization of functionalities, If the standard functionality that is available with the module isn’t meeting with the needs, then customization comes to rescue it and help business startups to get more out of the module. What is White Label Exchange Module? The Module that has already been thoroughly tested and proven to work. You won’t need to do an extensive research & waste time on design & development. A Ready-Made Solution for the business to provide a simple, clear path to their end goal. White label exchange Module allows you to customize the features to match your requirements with your own logo and theme to reflect your brand. How White Label Module Saves Time? Oodles Technologies is an offshore software development company with a focus on state-of-the-art technologies. They have the niche in awe-inspiring domains like Blockchain, Machine Learning, Artificial Intelligence, ERP, Big Data and Live Video Streaming. They keep close tabs on the latest trends and technologies with the highly skilled team of developers, & strive to deliver end-to-end development solutions at the best market rates. Now Start Your Business With our White-label Exchange Solution! Contact us and get started with the free demo!